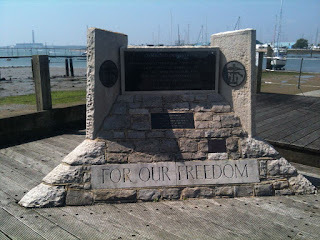 Back to Southampton today to complete the Hamble Ramble. I chose a good place to park, got out of the car and before I'd even started to get the bike ready, I was accosted by a pair of Jehovah's Witnesses, who politely asked me if I could talk with them for a minute. Now I'm always up for a bit of free entertainment, and I thought they'd probably appreciate some enlightenment on the subject of theology. So, they led off with their notion that God loves us. Fine, I thought, that's a good subject for discussion, and before they could enlarge on this idea, I interrupted and brought up the subject of the Flood. I pointed out that slaughtering the entire population of the world, bar a few, isn't really the action of a kindly deity. More of a deity that hates us, really. They said that, well, that was an exceptional circumstance, and it was because everyone else was wicked. And that when you have a barrel of apples and one is bad, what else can you do but discard the bad apple? So I pointed out, that if you're not God, you could use the bad apples to make cider, you don't have to destroy them. And if you are God, then you could make the bad apples good. So then I introduced Sodom and Gemorrah, another instance of God commiting genocide, killing everone in the two cities. They looked a bit glum. So I mentioned the Killing of the Firstborn. The man perked up a bit, and said that this was because Pharoah wouldn't let the Children of Israel leave Egypt, but I pointed out that Pharoah was being difficult because "God hardened his heart", as it explains in the bible. Which makes you wonder a bit about this "free will" lark they're so keen on ... yes, they raised that one. "God gives us free will, so we can choose between good and evil", so I pointed out that the will isn't very free when you're murdered for making the wrong choice, since dead people don't get the chance to do much of anything, let alone make free will choices. The woman averred that in all the time she's been talking to people, no-one had ever called God a murderer, so I pointed out that it wasn't actually me saying this, it's all in the Bible that her husband was carrying. He nodded, as of one who has actually read it. And I decided not to bring up all the other instances - there wasn't really the time, and I thought that three examples ought to be enough. By that time, I had the bike assembled and loaded up and ready to go, so they made as if to leave. "I do hope you'll be raising this next time you're at church," I said. I'd love to be a fly on the wall when that happens. So then I set off to do the second half the the Hamble Ramble. A couple of years ago, I picked up a few of these as drive-bys, a couple of days ago I did the ones on the west side of the Hamble, and today I was doing the east side. I found them all fairly easily, and stopped at the ferry "Bicycles £1.50" which the Hamble Ramble includes, and which I'd though of using, but there was absolutely no sign of it anywhere, so I didn't hang about. I biked back to the bridge crossing, and made my way to the final - completed at last! Then I relocated a few miles and found a great place to park and have lunch, then on to the parking place for the Auf Wiedersehen Pet caches; a very nice bike ride. I also picked up the cache in this area that I'd DNFed a couple of years ago. Here's the monument to the Commandos that set out from here in June 1944. A total of 41 caches done on a lovely day out.